Have you ever said phrases like “I'm not a runner” or “I could never run a mile”? Guess what? It's actually easier than you might think with the Couch to 5K app. You can literally go from sitting on couch to the finish line of your first 5K race in a matter of weeks. Here are five reasons to try the Couch to 5K app. The goal of running a 5K is a given but you can set personal goals for yourself each week. Set a goal to run for more than five minutes each day you run. Or set a goal to run a mile by the end of the week. 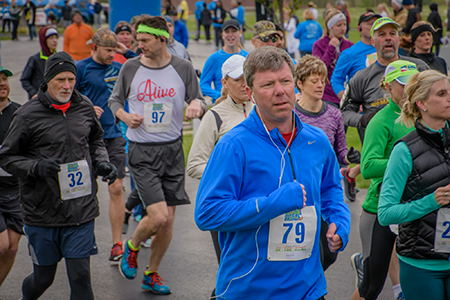 Once you’ve completed the couch to 5k training, you’ll be ready to run your first 5K. The Couch to 5K training consists of running and walking for 30 minutes a day, three days a week for nine weeks. Maybe the first day you’re only walking for the time allotted but by the end of the week you’ve gotten into a groove and are jogging. The app provides audio alerts to let you know when to walk or run. You can share your progress updates with your friends on Facebook. Each week increases the amount of running and time you workout so the app motivates you to keep going. You can also sync your own tunes in a playlist that will help you to run longer. The great thing about running is that it can be done alone or with a group. Grab your friends and encourage one another to run together throughout the nine-week training of Couch to 5K. Even better, find a race that everyone is interested in running and run it together! Couch to 5K is the perfect app for those who have never run before or aren’t sure about the sport. You training gradually builds from walking to running and increases each week. Challenge yourself to walk or run a little farther each week. White River Township residents can use Center Grove High School’s new Student Activity Center in addition to their Couch to 5K training. It’s the perfect place to walk or jog when the weather is bad. Once you have finished your Couch to 5K training then you’re ready to rock it with us at Rock The Block!